Here’s another layout for the same challenge mentioned previously but this time I wanted to do a vertical photo. I came up with this and like the way a different body part is in each frame. This entry was posted in Challenges, DigiScrappingTips on July 24, 2012 by Yobeth. These layouts are for this week’s challenge to use a single photo placed across multiple frames. I think these QP’s are really cute and I love the pics of my granddaughter in the swimming pool. If you like challenges you’ll love digiscrappingtips.com. We have daily & weekly challenges. Check it out. Today’s challenge word is stranger. The woman in this photo sat down beside me at the car wash. I was considering asking if I could take a picture of her finger nails but about that time she moved outside to wait. I took the opportunity to get a picture looking over her shoulder. Sneaky, I know! I don’t know what her story is but I do know there is no way she could do anything with nails that long. Really makes you wonder how she does some of the necessary daily things everyone has to do. Plus how in the world does she dial that phone? Good Monday morning! The photo word challenge today is mirror. My advise-while applying makeup be sure to check the mirror, lol! And be wary of letting your 7 year old cousin apply it for you. The kit I used here is Girlie Girl by Touched By A Butterfly. Celeste is an amazing designer and everything in her shop is still available at 35% off through Friday 7/27 using the code TBAB35. This entry was posted in Challenges, DigiScrappingTips on July 23, 2012 by Yobeth. Here are the Honey Bear quickpages I made for Touched By A Butterfly. Everything in the store is on special so now is a fantastic time to check it out. She has been so busy stocking the store for this “Grand Opening” event. Here are the QP’s. QP1 Link: http://www.facebook.com/l.php?u=http%3A%2F%2Fwww.mymemories.com%2Fstore%2Fdisplay_product_page%3Fid%3DTBAB-QP-1207-17945%26r%3DTouched_By_A_Butterfly&h=CAQH-rGY8 QP2 link: http://www.mymemories.com/store/display_product_page?id=TBAB-QP-1207-17946 And don’t forget to use the coupon code to receive your 35% discount. This entry was posted in Family and tagged honey bear, Touched By A Butterfly on July 22, 2012 by Yobeth. 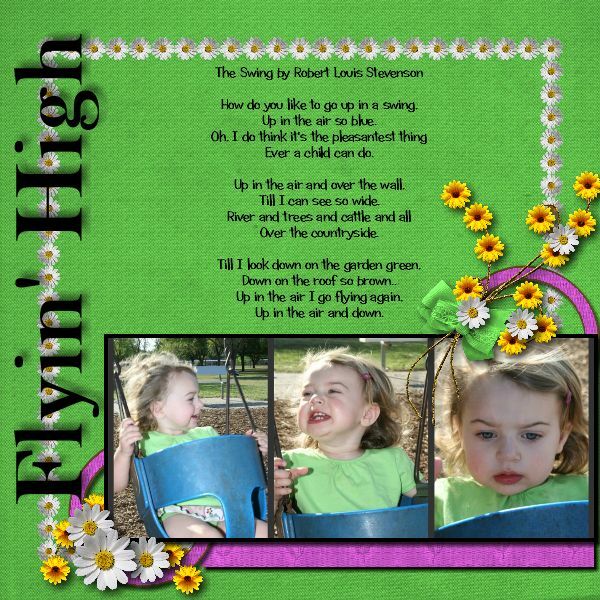 This entry was posted in Family and tagged honey bear, monograms on July 22, 2012 by Yobeth. Today’s challenge word is “upside-down”. This page reminds me of the fun & exhilaration of swinging. Just look at her expression! When I was a kid I loved to swing. I thought if I could just swing high enough I would eventually go upside down and right on over the top! It never occurred to me I might fall out of the swing if I turned upside down, lol! This entry was posted in Challenges, DigiScrappingTips and tagged exhilaration, expression on July 22, 2012 by Yobeth.